Alt-rock icon Kristin Hersh can be excused a spot of California dreaming ahead of her Perth debut. 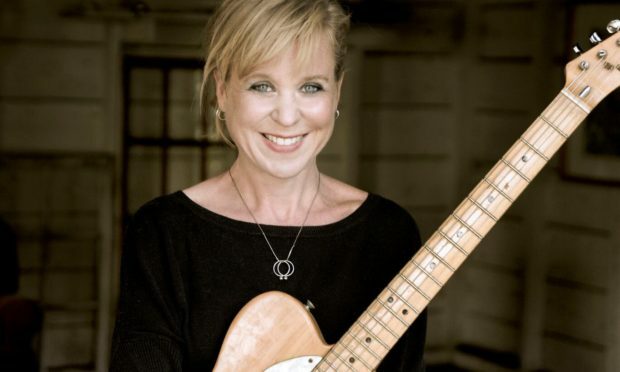 The Throwing Muses founder plays Perth Theatre on Monday as part of her new band’s maiden UK tour, but her thoughts are clearly somewhere on a shoreline near her Golden State home. “My youngest son is a pro surfer and we live south of LA,” she explains. Kristin, 52, likens surfing to musicianship. “They look for heart as well as ability and the experience of learning the craft is very solitary,” she says. “It’s really hard but it seems to make for good people whose ethos is very healthy. People who spend their lives in the ocean learn from it. They have to develop a technique to respond to something out of their control and it makes them good music listeners. The Rhode Island-raised songsmith has branded her latest off-kilter solo album Possible Dust Clouds as “sociopathic”, a pertinent description given her frankness about her own mental health issues down the years. “I think it’s a happy record, I think sociopaths are often happy people,” she laughs. “I just needed a way to describe the straddling that pop music does. People use it often to just mean crap music but the pop form is a beautiful idea that’s unpretentious and yet challenging because it has to be moving music culture forward. Kristin says the visceral nature of her songs means she rarely follows any script in the recording studio. “I know everything I want and I’m always completely off base, which I love,” the ’80s veteran declares. Always prolific, Kristin’s concurrently working on new solo material alongside potential Throwing Muses and 50 Foot Wave albums — but don’t expect a swift flurry of releases. “You live with your projects when they’re long-term,” she says. “It’s sort of like my children. I don’t want to form them, I need to respond to them. Right now I have a nice combination of my beautiful bandmates Fred Abong from Throwing Muses and Rob Ahlers from 50 Foot Wave with Fire Records on our side, plus listeners who have an interesting take on music as medicine and what they need to be here and not feel alienated. Kristin says her electric trio relish having “ultimate freedom” in their live shows. “I wish it wasn’t called my name but it doesn’t really matter, it’s just music and we’re allowed to play songs from all these different bands,” she adds. *** The Haggis Horns are Thursday’s big draw at Clarks. The Leeds seven-piece played with jazz fusion outfit New Mastersounds before releasing the first of four Afrobeat albums in 2004. Members’ credits include Amy Winehouse, Martha Reeves and Elbow. Tickets £11.25 at Eventbrite. *** It’s prog rockers Galahad at Kinross’s Green Hotel tomorrow, with ex-Lindisfarne duo Billy Mitchell and Ray Laidlaw playing the folksters’ hits on Thursday. Bookings via Ticketweb. *** Tartan tribute Mactallica and Glasgow’s Last Alibi play Beat Generator tomorrow. Tickets £9.50 from Grouchos / Tickets Scotland. *** Soul exponents The Messarounds plus DJs Derek Durno and Steve Keenan hit Clarks on Sunday. Tickets £6.88 at Eventbrite. *** Number 57 hosts Tivvy and Chain Gang this weekend.